Pancreatic cancer begins in the tissues of your pancreas — an organ in your abdomen that lies horizontally behind the lower part of your stomach. Your pancreas secretes enzymes that aid digestion and hormones that help regulate the metabolism of sugars. 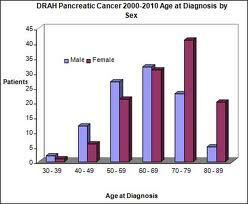 Pancreatic cancer occurs when cells in your pancreas develop mutations in their DNA. These mutations cause cells to grow uncontrollably and to continue living after normal cells would die. These accumulating cells can form a tumor. 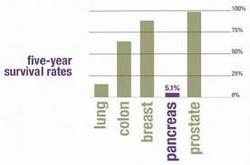 Did you know that pancreatic cancer is the nation’s fourth leading cancer killer? Worse yet, unless it is found early when it can be surgically removed, there is no cure. Yet, there are no tests to find it early. How can this be? Only ten years ago, less than a dozen researchers were focused on pancreatic cancer. There simply wasn't enough funding available to support a career in the study of this disease. As a result, pancreatic cancer was virtually ignored, and with startling consequences to patients, their families and loved ones. Pancreatic cancer often has a poor prognosis, even when diagnosed early. Pancreatic cancer typically spreads rapidly and is seldom detected in its early stages, which is a major reason why it's a leading cause of cancer death. Signs and symptoms may not appear until pancreatic cancer is quite advanced and surgical removal isn't possible. Students at Tahquitz High School have decided to take a stand by creating a fundraising page to support The Lustgarten Foundation. The Foundation was created to find better treatments and a cure for pancreatic cancer. See your doctor if you experience unexplained weight loss, abdominal pain, jaundice, or other signs and symptoms that bother you. Many diseases and conditions other than cancer may cause similar signs and symptoms, so your doctor may check for these conditions as well as for pancreatic cancer. Pancreatic cancer can be controlled only if it is found before it has spread, when it can be removed by surgery. If the cancer has spread, palliative treatment can improve the patient's quality of life by controlling the symptoms and complications of this disease.